No doubt everyone’s seen the article on Petapixel which can best be described as successful clickbait – by Sator, essentially claiming that the whole idea of mirrorless full frame is flawed. Well, the good news is that this article is more flawed than the flaws it’s claiming to point out. First of, let’s simply dismiss the groundless myth that a shorter mount to focal plane register (body thickness) cause any problems with lens design. It simply doesn’t. Nor does an empty space without any body at all. The only aspect of register which can ever cause problems is additional body thickness, as found on single-lens reflex (SLR and DSLR) designs. In the early days of SLRs, it caused so much trouble for the design of very wide-angle lenses that SLR mirrors had to be locked ‘up’ and a lens fitted with a rear assembly almost touching the shutter, sticking right back into the darkchamber. The quote from Zeiss in the article about the ‘short flange distance’ being an engineering challenge for wide-angle lenses may well be a result of mistranslation as it’s hard to imagine any Zeiss engineer actually saying that and meaning it. This is the company which effectively built the Hasselblad SWC, not to mention the aerial and stereoscopic models based on the 38mm f/4.5 Biogon. And they made the Hologon camera. Flange distance? What flange distance? Take a look at the optical design of one of the best Zeiss/Sony collaborations, the RX1 series with its 35mm fixed f/2 lens, and you’ll see that Tatsuo Kureishi, Sony product planner, was probably right to say this: “We eventually realised that only a camera with a non-interchangeable lens could significantly increase image quality, since it would allow us to optimise performance between the lens and image sensor.” And what did he mean? That by not even having a focal plane shutter, by having an even slimmer body than the E-mount, a lens which almost touched the sensor, they could engineer something better. And they could align it to perfection. The ghosted product view below says it all. As far as I have been able to work out, the actual body register of the RX1 would be around 12mm, or like the FE mount’s 18mm but with the lens sticking into the body even more than the 5mm depth of the E-mount bayonet. Now if there’s any reason the A7 series can’t have the same 35mm f/2 as the RX1, it’s down to the shutter assembly and the filter/coverglass pack of the sensors used in A7 bodies. But it’s not to do with the mount, and as this lens proves perfectly, claims that you ‘can not get lens performance without size and weight’ are also made on a weak foundation. A 46.1mm throat placed 18mm from a 43mm diagonal image sensor clearly isn’t ideal, but it’s for ever better than Fuji’s 44mm throat at the same 18mm. Or is it? Measure the actual mount, and the 46.1mm turns out to be a generous figure including the bayonet recesses. The real circular size is only 43mm and the internal diameter once any mount is fitted is only 42mm. The electronic contact array removes a further 4mm but fortunately not in a bad place. On the Fuji X mount, the contacts are placed to prevent any real chance of a full frame body (the same applies to Canon’s EF-M mount). 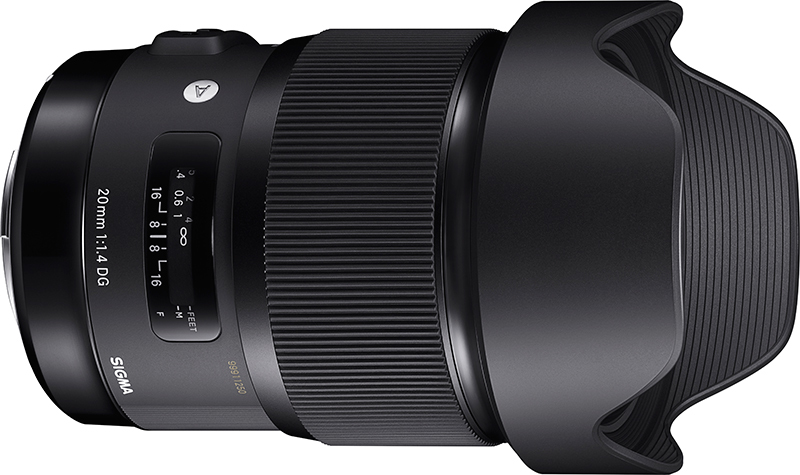 Sony got in by the skin of their teeth, and it is this mount diameter which actually starts to impose design contraints on lenses and makes some of them larger. A good example is the 85mm f/1.4 GM. That, in its purest form, would be a lens normally positioned >85mm from the sensor with an aperture diameter 0f 60mm. However, many of image-forming rays from this would be obstructed by the E-mount. A complex telephoto construction is therefore needed which reduces the virtual size of the lens aperture as seen from the focal plane and simultaneously moves its apparent location closer (placing the rear nodal point of the lens somewhere between 18mm and 85mm). Most lenses longer and/or faster than 50mm f/1.2 will need some increased complexity of design to condense the exit pupil. But against this, there’s a fortuitous benefit. Digital sensors, with their optically active filter/low-cut/IR glass packs, don’t respond well to very oblique angles of ray incidence. If you can make a telecentric lens – one which produces an almost parallel bundle of image-forming rays from a greater register distance – you’ve overcome this issue. That is what Olympus did with the original FourThirds format, which if scaled up to full frame size would have had a 77mm register – and they made their lenses telecentric, which means they produce a relatively parallel ray bundle, with a long back focus. Although FourThirds is now almost obsolete, it did have this odd advantage (also a real challenge which Olympus overcame in the creation of a fully retrofocus 7-14mm zoom with a 38mm register). The point I’m making is that large size, complexity and weight are not as so many state ‘laws of physics’ relating to making good lenses. They may simply be the most expedient solution. Remove all constraints – as Sony did with the RX1, Minolta did with the TC-1, and Ricoh did with the original film GR – and exceptional lenses can be made to be very compact, almost as compact as the theoretical physics will allow. Indeed it surprised many users to find large glass elements almost touching the film plane in some cameras. Sorry to be so wordy but it needs explaining. Does it matter? Yes, if you still believe in a Sony A7/FE system which can be as compact as a Leica kit used to be. In fact the E-mount makes it possible to design slightly smaller medium to long zooms and very much smaller wide-angles, and normal sized standard lenses. To adjust your perception, it’s important to take Sator’s camera size comparison images and align the focal plane index marks, not the front or back of the camera body. It’s surprising how much of an A7RII is behind the sensor plane. The screen grab above is from Sator’s article. It purports to compare two 85mms. There’s just one small problem – it doesn’t. The lens shown fitted to the A99 on the right is the 24mm f/2 CZ SSM A-mount, not the 85mm CZ. The 85mm is 1mm shorter but 3mm fatter with a generally chunkier look, and if you align the focal plane index marks, its front would come almost exactly level with the GM lens. It’s still smaller than the GM but if comparisons are to be made this way, they really should be correct, not wrong. Blame Canon and Nikon. Both have had SLR mirror paths which are very generous, and there are some lenses you can adapt to Canon which will give you a damaged mirror and lens in return (those lenses can’t be adapted to Nikon at all). Makers like Sigma and Tamron have to design all their lenses to clear the Canon full-frame (EF) mirror swing, and if that means adding 5mm to the back focus and then adding even more in glass to the overall assembly to make this work, so be it. Therefore, when a nice fast 20mm f/1.4 Sigma appears designed for a retrofocus with a 42mm physical clearance, it’s going to be the same size when remounted (if they ever do) for a skinny 18mm register. Actually, the same size plus 24mm of deadspace extension. If you think that a fast superwide is bound to be huge, try a Voigtlander 21mm f/1.8 Ultron in Leica M fit. It’s not f/1.4, but it’s also the size of your palm not your forearm – and no doubt an autofocus lens could be made much the same. In fact you can buy an E-mount to Leica M autofocus adaptor and turn it into one. My point is that where Sony’s own lenses may sometimes be fairly large in order to deliver the best results from the existing sensors and the mount constraints, DSLR system lenses can be even larger. Where there is potential for Sony native lenses to be small, there’s very limited potential for this with DSLRs. I use a couple of rare examples, the 20mm f/3.5 Voigtlander Nikon fit wide and the Canon 40mm f/2.8 STM pancake. They are exceptions. Within the range from 28mm to 90mm, there have always been excellent and fairly compact lenses for all types of system – Contax G, Canon, Nikon, Pentax, Leica, Minolta CLE. Sony should look to these for inspiration for a core set of lenses, and seem to have done so with the 28mm, 35mm, 50mm, and 55mm. A neat 85mm f/2.8 next in line then? The general comment that adaptors introduce error is very true, but Sator doesn’t explain why the E-mount is so prone to such errors. Let me do so. It was designed, from the ground up, to be self calibrating and not to require much precision. When the original 16mm f/2.8 pancake was launched with the NEX-3 and NEX-5, that lens had so much focus travel it could go well beyond infinity. Just 0.1mm makes a huge difference with a 16mm lens at f/2.8 – and the actual flange to sensor register of those first bodies was not even accurate to 0.1mm. Sony just made the lenses able to cover the manufacturing tolerance, because the on-sensor contrast detect focusing always got it right. You would never know if a body had 0.1mm or 0.2mm variation from spec, as the lens had more than this leeway. Why the A7 system still wins – though now old, a Voigtlander Leica screw original 12mm f/5.6 ultrawide works well using a $10 simple adaptor. A very much more expensive adaptor – $300 – turned out to have incorrect infinity focus. Then along came awkward early buyers of adaptors and lenses like the Voigtlander 12mm, or for example the 40mm f/1.4 which was the lens that really alerted me to the problem. These lenses are calibrated to Leica focus register with the aim of a hard infinity stop. They are supposed to hit infinity just as the stars in your night sky snap into perfect focus. We found that whether this happened depended on the individual Sony body and also on any adaptors. Manual focus lenses were not self-calibrating! That’s why the Fotodiox Tough-E mount arrived, why Sony tightened up generally on tolerances after the A7 and A7R, and also why makers like Samyang wisely allow a generous over-run past infinity for manual focus lenses (their 12mm f/2 for E-mount is an example, with plenty of tolerance to handle different bodies). Now all of Sony’s E and FE mount autofocus lenses have continued to be self-calibrating. They do not have hard infinity stops and many don’t form an image properly at all unless powered up (the power moves groups and elements into position, centres any stabilisation group, and finally performs AF). The start-up routines can also involve opening the lens aperture and closing it, often every time the shutter release is touched for first pressure. This is why expert users often prefer to AF using an assigned custom button, not the shutter release. It can save a wasted quarter-second and greatly speed your response time for action and grab shots. It’s also why manual lenses are popular, as these always shave the response time of the camera body down to an absolute minimum. The mistake some make is to assume the Sony E-mount needs to be as precise and accurate as a 35mm SLR or DSLR. It does not. It may feel like a precision instrument but in fact it’s not. Where an SLR design requires micron precision in alignment of the lens mount and the focus plane, the principal mirror and the secondary AF mirror, the AF module, and the focusing screen – all at once – the E-mount mirrorless requires only two conditions to be met. The axis of the lens should be centred on the sensor, and should be perpendicular to the sensor (and any focus mechanism used should retain this). If this is achieved, all other degrees of precision can be covered by tolerance. Obviously the IBIS, 5-axis moving sensor, does require considerable engineering excellence to do what it does and keep everything right. But unlike the old DSLRs, it will never need you to adjust hidden screws just to get the focus working properly. Sator suggests that with such a small throat aperture, the 24 x 36mm stabilised sensor really can’t do its job. We all saw the first demonstrations of AS, or SSS, or SSI or whatever we call it – the sensor apparently gyrating over many millimetres. 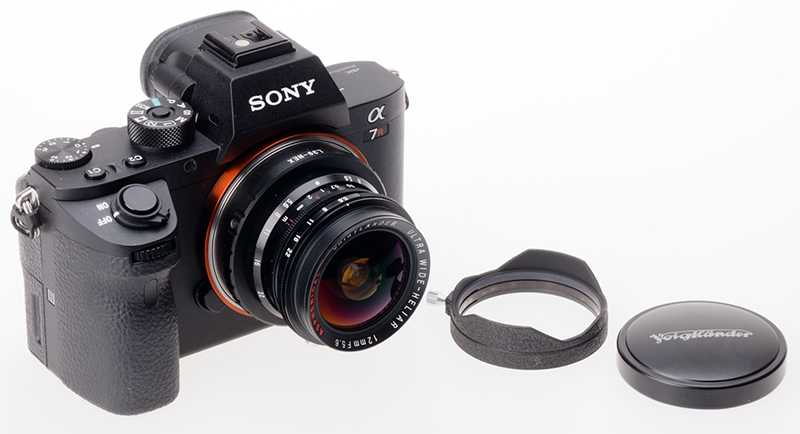 Those who bought the original Sony A100 and 16-80mm CZ lens also found that sometimes the sensor would be a little more off-centre for the shot and one corner would be sharply vignetted. Well, you might expect that from the A7RII with certain lenses but in fact I’ve never observed it. The IBIS never allows the sensor to sit off-axis. It will constantly correct for your wavering hold, but always return to a centred position. It’s not trying to dive 5mm past the shadow of the lens throat or outside your lens image circle, even if it can do so in theory. The real stabilisation corrections made are within a millimetre or two, and even that is a considerable blur when there are over 200 pixels in one millimetre of travel! Consider what a 200 to 400 pixel blur looks like. What IBIS is doing often corrects shake producing blur in the region of 2 to 20 pixels. So, the reply to the apparently valid point that the whole sensor size, stabilisation movement, lens throat size, and lens image circle combine to make Steady Shot Inside a guaranteed failure can only be this: it works. It’s like a bicycle – look at it, think about it, and it’s not promising… but in practice it works very well. It also works, however its firmware interfaces with lenses, to use OSS optically stabilised Sony lenses very successfully. The Leica screw system was probably designed with its 39mm lens thread much smaller than the diagonal of the film gate because it was originally made for an 18 x 24mm ‘single frame’ (later called half-frame) format. When a fixed lens was replaced with the screw mount, the inherent problem of having this smaller than the film diagonal was missed. That gave later generations the vignetting Leica Visoflex and the limited range and performance of all lenses over 135mm focal length! To some extent Sony has done the same thing and simple large aperture long lenses might in theory vignette. In practice they don’t. The limitations are nothing like the Leica or Contax rangefinder mounts were in the past. 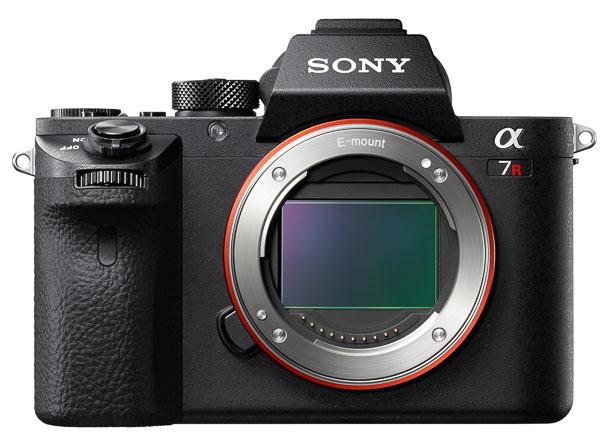 The argument against full frame mirrorless, or the specific design of the Sony FE/A7 series, ignores many things including simple points like volumetric heft (looks very different from overhead views of the camera footprint) and multi-body kits. I use A7RII, A7 and A6000 and all three bodies together barely take up the baggage space of a single pro DSLR. So, just relax. The Petapixel article was not a very carefully constructed one or a balanced argument. You’re going to find many different form factors of digital camera in future. 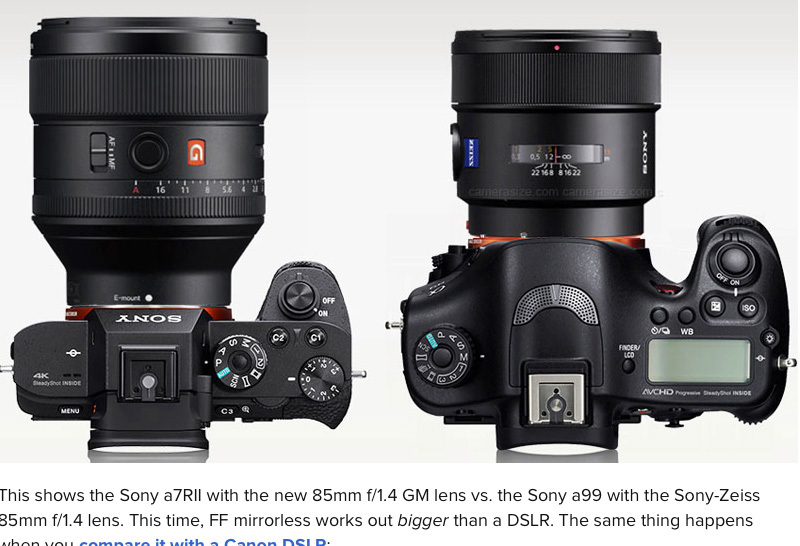 The Sony full frame mirrorless system is just one. Because Fujifilm, Olympus, Panasonic, Nikon, Pentax, Samsung and Canon have all made design decisions for their mirrorless offerings which rule out full frame it’s not going to have ‘competition’ right now, and all users of other systems will find reasons why it doesn’t work for them – or take the plunge. Subscribe to f2 Cameracraft our bi-monthly magazine – worldwide subscriptions by fast airmail, premium ultra-heavy print quality and the best of British printing technology (it even smells good). Entirely logical or not, Sony deserves some questioning of their lens design, and even more to the point: their extra thick sensor cover. 1.9mm vs 1mm for D810. Basically that thick cover means the steep ray angles from RF wides cannot be handled without extra aberation. For 400USD one can have a normal sensor cover installed by Kolari and suddenly all the compact Leica lenses start to really behave, and the A7 really is smaller than a DSLR. But all the big native lenses, with QC highly varied, and ergonomic issues, is going the wrong direction, I’d have to agree. The mount itself is needlessly narrow, just to keep the E mount going, and save money, like the batteries, by using not what’s best for the long run, but what’s in the parts bins. The first point is that E mount may be a bit tight, but the evidence is it’s wide enough (just) and that, in any event, it’s still wider than M-mount. There is the theoretical possibility of a bit of extra vignetting in the corners at large apertures on lenses where the exit pupil is a long way from the sensor. However, in practice, long lenses are telecentric in design which mitigates against that and doesn’t seem to be an issue for something that is easily corrected in any event. Second, what sort of message do you think it would have conveyed if Sony had discarded E-mount in favour of a slightly larger one for the 24x36mm format? Would APS-C continue on E-Mount with a separate, parallel new one for the A series (which means no mounting of FF lenses on APS-C bodies or vice versa – not room for an adapter in these cases). That’s without the extra costs for tooling for supporting two standards. Or would future APS-C bodies carry the new mount thereby stranding owners of existing E-mount lenses? The individual sensor design (of which the cover glass is one issues) is not the same as the mount. It appears that the A7R II is a lot more tolerant of symmetrical WA lens designs. As for a super-compact 24x36mm body, then that would clearly not be an A7 style body. What is possible is something along the lines of a 24x36mm version of the A6300 (IBIS would have to go to save space), with special attention to the sensor to make it more tolerant of symmetrical WA lenses. Such a camera could, well fill the same niche as the Leica M series and it’s even possible provide for AF on non-native lenses using the Techart-style adapters. But if what people want is compact and very fast long and medium-long focal length lenses, then that’s asking for the impossible as the size of the aperture along (and therefore the front element) will become the dominant factor. It’s simply written into the laws of optical design. Bad Science? Hasn’t Ben Goldacre trademarked that? In any event, the idea that a short lens register distance was ever a problem in itself could only be promoted by an idiot. What is, of course, an engineering challenge is designing lenses to make best use of the short lens register distance to produce the most compact design compatible with good optical performance on a given sensor. A bit of a moving target to be sure as sensors become a bit more tolerant. As far as the throat diameter is concerned, then I don’t think it’s a coincidence that Sony adopted one for E-Mount that was (just) viable for 24x36mm lenses. I can imagine a meeting where a few engineers decided (outside of the earshot of accountants) to provide for that possibility. What surprised me is that IBIS could be used on 24×36 without a notable deterioration in corner vignetting (although corner performance is generally irrelevant to the sort of photo where IBIS is relevant – landscapes, architectural and fine art is done with a tripod; IBIS matters for hand-held, sports, street photography and the like and in those cases who on earth looks at the corner performance?). The throat diameter does become an issue with IBIS on very long focal length lenses but then there’s always lens stabilisation for those (and the complementary IBIS roll correction works fine with that). Then there’s the issue of 24x36mm. Who ever decided that is some sort of magical format? It’s an accidental standard that emerged from using movie stock film and it was found to be a decent compromise (at the time) between quality and compactness of camera/lens combination. With digital sensors, even if a given throat diameter wasn’t able to provide an image circle which can cover the 24x36mm format, it might manage something a little smaller but still give significant improvement. I tend tend to think that you need to (roughly) double sensor area to provide enough of a margin to make format switch worth doing. 24×36 is 2.25 x APS-C. But 22.7×34 would have been almost as good albeit that it wouldn’t get the bragging rights of FF. (People forget top-of-the-line Canon’s EOS-1D had a 19.1 x 28.7mm sensor, and was considered class leading at the time). The “hard infinity” issue on M-Mount lenses could have been resolved if the adapter designers had built in a way of making minor adjustments. A very short helicoil and some grub screws would have done the job. In hindsight, obvious, but we live and learn.